Natural Rubber Ball, Squeaky Action Webbed Wonderball. A new upscale look and improved ergonomic grip are included with this launcher. Benefit from no slobber hands-free pick up of balls. Easily throws balls three times farther than an un-aided arm. Exercise dogs in a fraction of the time. BOODA WING-A-BALL - LARGE - Spin it! Throw it! Catch it! Tug It! Interactive dog toy is designed for maximum tossing, tugging and chewing. High visibility two-tone ball, extra wall thickness. Use with Chuckit! Mega Ball Launchers. Environmentally friendly design utilizes recycled natural rubber. Use with Chuckit! Medium Ball Launchers. These balls float, bounce high, are easy to clean, and are made of natural rubber. For use with bigger dogs. Use with Chuckit! Mega Ball Launcher. These balls float, bounce high, are easy to clean, and are made of natural rubber. For use with small dogs only. Use with Chuckit! Mini Ball Launchers. 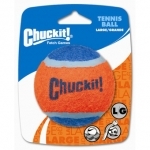 A high bounce, fun bright colors, and easy to clean natural rubber make this a great fetch solution. Use with Chuckit! Medium Ball Launchers. Assorted three ball pack includes Max Glow Ball, Whistler and Rebounce Ball all in medium size. Use with all Chuckit! medium ball launchers (06600, 06800, 06500, 06300). Tougher, thicker material makes this the perfect choice for the dog who destroys everything. Durable rubber squeaky bone holds up to tough play. Made with safety Tested non-toxic paint, includes a squeaker for added entertainment. Great for interactive play. Durable rubber squeaky ball holds up to tough play. Made with safety Tested non-toxic paint, includes a squeaker for added entertainment. Great for interactive play. Air Squeaker toys are covered with nonabrasive tennis ball fabric will not wear down dog's teeth. All squeaker units are recessed in rubber and covered with tennis ball fabric for safety. Enjoy extended playtime with the bright, long lasting glow. Charges quickly under any bright light. No batteries needed. Easy to clean rubber. For use with small dogs only. Use with Chuckit! Mini Ball Launcher. For use with bigger dogs. Benefit from no slobber hands-free pick up of balls. Easily throws balls farther than an un-aided arm. Exercise dogs in a fraction of the time. Use with large Chuckit! balls 3. Tough new toys from JW Pet made of our durable Megalastomer. Infused with vanilla. For use with small dogs only. Benefit from no slobber hands-free pick up of balls. Easily throws balls farther than an un-aided arm. Exercise dogs in a fraction of the time. Use with small Chuckit! balls 2. Ultra compact sizing makes for superior ease of transport. Great for no slobber hands-free pick up fetch in smaller spaces. Exercise dogs in a fraction of the time. Use with medium Chuckit! balls 2.5.